A Lion Air Boeing 737 passenger plane has come down after taking off from Jakarta, say Indonesian officials. Flight JT-610 was on a scheduled flight from the Indonesian capital to Pangkal Pinang, the main city in the Bangka Belitung Islands. It was not immediately clear how many people were on board the plane, believed to be a Boeing 737. Yusuf Latif, a spokesman for the national search and rescue agency told reporters: "It has been confirmed that it has crashed." 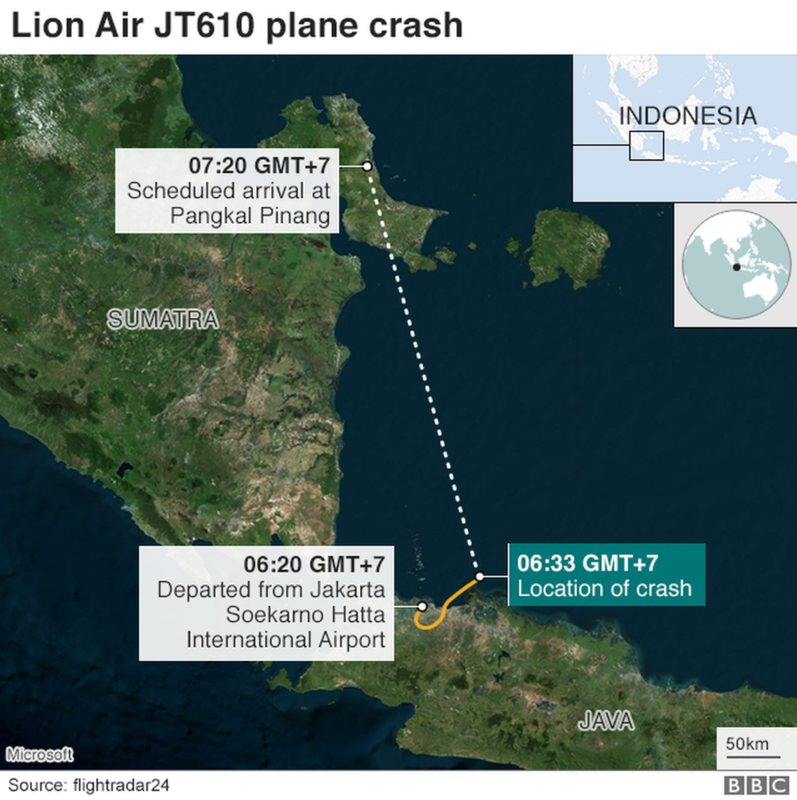 A Lion Air official earlier told the BBC the company did not yet know what had happened to the plane. The aircraft was reported to be a Boeing 737 MAX 8, a model only in use since 2016. That is one messed up speed and altitude graph. 334 knots at 1600 feet. Holy crap!! They were all over the place. Terrible news. As Ex-9A Guy said, that’s a weird profile. Also this is the first hull loss a 737 MAX. Looks similar to Aeroperú Flight 603...pitot static problem ??? At least the CVR and FDR are easily recoverable......reports indicate the aircraft is in 100 feet of water. "The previous flight of the accident aircraft, JT043 from Denpasar, showed similar erratic values in altitude and airspeed after takeoff. After 8 minutes the values stabilzed. An unverified tech log item for that flight, sent to ASN, remarks "Airspeed unreliable and alt disagree shown after take off.[...] Identified that CAPT instrument was unreliable and handover control to FO." While this particular purported tech log note is unconfirmed, Lion Air did confirm that the aircraft had a "technical problem" on the previous flight, "which had been resolved according to procedure,” according to the airline." Young airframe only operated for 3 months since new. That seems to align with the flightradar24 profile. Gonna make an assumption here. Lets say there was unreliable airspeed and altitude indications on both sides. The weather was VFR and daylight...... what is the problem ?? The CVR and FDR are going to be really interesting. Plane crashes are often the result of a combination of factors - both technical and human - but could the fact that the plane was so new have played any part? Budget carrier Lion Air said in July it was "very proud" to be the first in Indonesia to deploy the plane, and that it had ordered as many as 218 units. The plane involved in Monday's incident has only been in operation since 15 August. A technical log obtained by the BBC for that flight - from Denpasar airport in Bali to Jakarta - suggests that the airspeed reading on the captain's instrument was unreliable, and the altitude readings differed on the captain's and first officer's instruments. Lion Air have not confirmed the report, but this may have been the unspecified "technical problem" that the company's chief executive said the plane's Denpasar to Jakarta flight had suffered from. Edward Sirait said that this problem had been "resolved according to procedure". "If it's very new there are sometimes snags that only reveal themselves after they are [used routinely]," he said. "These usually get sorted [within] the first three months." Another analyst, Jon Ostrower of aviation publication The Air Current, said there were "always new teething issues... that's common, but a far cry from something that would threaten the safety of an aeroplane". He added that new planes generally "enjoy a maintenance holiday because everything is so new, not the reverse". "I don't know what would make a plane this new crash," Mr Ostrower told the BBC. "There are so many different factors that can contribute to an accident like this." Mr Soejatman said he believed it was "likely to be technical issues that caused it but it's still very early days". "We can really [only determine the cause] when we get more information," he said. Indonesia's poor aviation safety record, though, has other experts believing that factors such as human error or poor oversight are more likely to be behind Monday's tragedy. I’m not familiar with the 737. What is the procedure for unreliable airspeed and altitude indications on the Capt’s side? Do you need to select ADC#2? I think the more recent Boeing (777, 787, and Max) aircraft all have the same memory item for this event. Everything is turned off and simply fly an attitude and power setting. It quickly becomes a real CRM exercise and probably a handful when you least expect it. So a system defect that caused an event momentarily beyond their pilot skill level and could Boeing be having some quality control issues on their production line? Inbound flight has a problem - overworked MTC does a power down/powerup and says, "no fault found" or, even worse, swaps ADCs or some other component and doesn't tell crew. Now problem comes back - airspeed and altitude disagree - and crew believes, based on prev flight, that the Capt's side is at fault and FO attempts to fly on bad info. So they go in like a lawn dart ??? Good grief...it was daylight VFR....does no one know how to look out the window and fly??? The ADS-B signal received from Flight Radar 24 is generated by the aircraft itself not SSR. So that track should be indicative of exactly what the aircraft was seeing. It would be interesting to see the track compared to the actual SSR trace. Well, I agree with your sentiments - just positing some thoughts - not saying I understand it. It might be a historical Industry turning point for the improper and sometimes overused “Ground Checked Servicable”. Yeah, I doubt that. It’s not always improper. How about, “System re-set accomplished and tested serviceable I.A.W. AMM 34-10-00”. Sometimes that’s all that’s necessary. Yeah, I doubt that. It’s not always improper. How about, “System re-set accomplished and tested serviceable I.A.W. AMM 34-10-00﻿”. Sometimes that’s all that’s necessary. Pitot static test? Sure, fine, if they did it. More than likely it was a PD/PU and a cursory check for an active fault. NFF? Alrighty then, carry on, good to go! Good point unfortunately there may be some newbies who cannot. Neither you nor I have any idea what went on regarding maintenance prior to that flight. How about we just wait until the facts come out, instead of slamming the Maintenance people involved, or the pilots that couldn’t seem to fly an airplane in clear weather? Based on the graph alone it would appear that the aircraft was in descent at a high speed and that fact alone would allow for extreme destruction of the air-frame and its occupants. Let's assume the airspeed/altitude problem was happening during the crash...and BOTH pilots were consumed with attempting to rectify the problem, in other words, neither was aware that they were in dangerous proximity of the water and the airspeed was increasing. I have personally only done two landings on water, (twin otter), and I can tell you that the worst condition for KNOWING how high you are above the water is when flying over relatively calm water without looking at a fully serviceable altimeter. If you look at the photo of the crash scene as well as the wx reports you can see that the ocean would be pretty calm at the time of the crash. Blue sky, blue water, little or no definitive horizon and perhaps some confusion in the cockpit with respect to "how high are we and how fast are we going? " could contribute to an upset with a unfortunate ending. Like I posted....CVR and DVR will tell the tale and we can all speculate till the cows come home and obviously,at this time, we are all just guessing. Really? Every single time? Yeah, we know, "wait for the facts to come out." Thanks for posting this sage advice but it won't stop people from discussing the accident or putting forward possible causes based on their life and work experience. Those pilots, apparently, couldn't fly the airplane in day, VFR conditions so that's part of it. Will poor maintenance procedures be the other part? I guess we should wait to find out (but I don't think anyone would be too shocked to hear it was). Don't read too much into that - not necessarily saying that some individual failed in their duties or was negligent, might be at the corporate level or even a poor procedure designed by Boeing. I'll chime in here. Yes. Every single time. Of course the temptation is strong. But speculation is not a risk free exercise. The question we might want to ask is, why do we allow ourselves to follow that rabbit hole? The 'well, it improves flight safety' argument IMO is, quite frankly, BS. Safety is built on what we know. Not what we think we know but can't prove. Has no one here ever flown or worked with someone who was doing something silly or outright dangerous because they heard that so and so had followed the SOP and it screwed them up, so this was better somehow? Well. I have. And I have been on the team that has followed the end game of the spread of speculation-based SOP drift. Real answers sometimes take a long time to become public. Some of the crap that speculation creates to fill the void can fester for months and morph into really serious trouble. So, speculate if you must, but it's offside to go after someone for reminding us all that waiting for the facts is an option.